Gavin Brown's presentation by Brian Belott. In a stunning colonial fortress overlooking the turquoise waters of La Puntilla bay in Old San Juan, the MECA Art Fair opened its second edition on Friday. Designed to unite Puerto Rico’s rich cultural ecosystem with key North and South American stakeholders, the fair’s second iteration at the Arsenal Antigua de la Marina Española comes at a pivotal time for the island: While the majority of hurricane relief efforts have been completed, Puerto Rico’s economy remains substantially stagnant. Fair organizers Daniel Baez and Tony Rodriguez are primarily concerned with making Caribbean art more accessible for local populations, and more compelling to international collectors. Derek Alexis Courd’s drawings at White Columns’ booth. Featuring a heavy roster of both Puerto Rican and New York galleries—including White Columns, Gavin Brown’s Enterprise, 47 Canal, Embajada and National Gallery—the fair’s offerings present a particularly dynamic array of works. Though sales are certainly a focus of the fair—last year’s event garnered roughly $600,000 in profits for participating galleries—the majority of fair participants are attending for rather altruistic reasons. Cristina Brache’s installation with Fierman gallery. David Fierman of Fierman Gallery in New York is similarly motivated. “There’s certainly the political and economic interest of bringing publicity to Puerto Rico,” says the gallerist, who for the fair brought along Puerto Rican-born artist Cristina Brache. Brache’s work is a commentary on Latin America’s obsession with beauty; for the fair, the artist debuted an installation inspired by the Miss Universe Pageant. 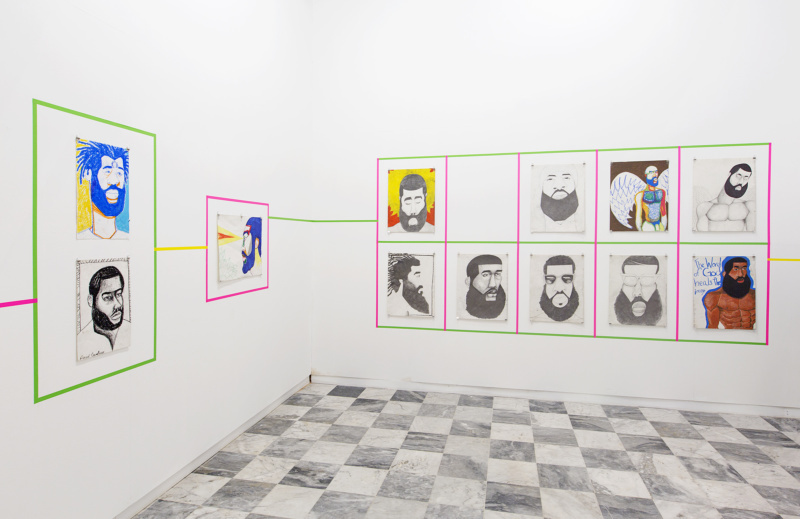 Y Gallery’s presentation of Ryan Brown’s Untitled (let sleeping dogs lie), 2018. Other compelling booths include Y Gallery, who presents Ryan Brown’s Untitled (let sleeping dogs lie) (2018). 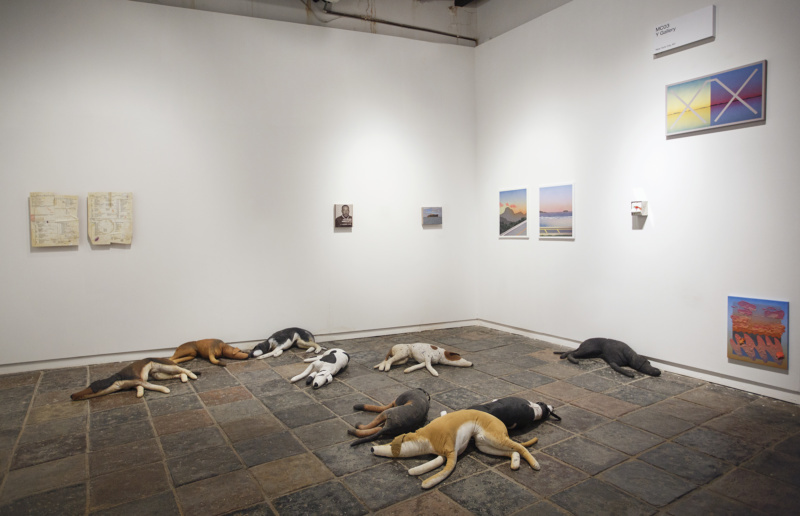 The work features a haphazard array of sand-stuffed acrylic dogs strategically placed at surprise locations around the fair, as well as within the gallery’s booth. 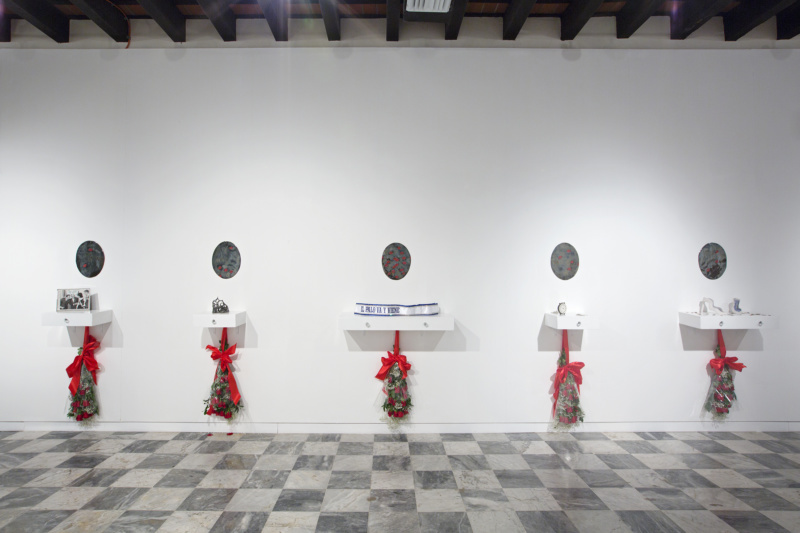 National Gallery also presents a set of imposing abstract works by Melvin Martinez, which uses found objects and thickly layered acrylic paint to communicate the artist’s frustration with the current political scheme on the island.